The Patrician Banquet Center has earned an outstanding reputation for Quality, Style, and Service. Our award winning facility combines the perfect blend of experience and creativity to make your special occasion a memorable success. Whether you are planning a wedding or even a corporate event, we will provide the service and quality you desire while maintaining extremely realistic prices. Our staff works on your event from beginning to end for a personalized experience that will exceed your expectations, and offer memories to last a lifetime. Our eclectic creativity melds together perfectly with our fresh and quality ingredients to create flavorful presentations for every event! Browse through our photo gallery to see for yourself why everyone is talking about the Patrician Banquet Center. 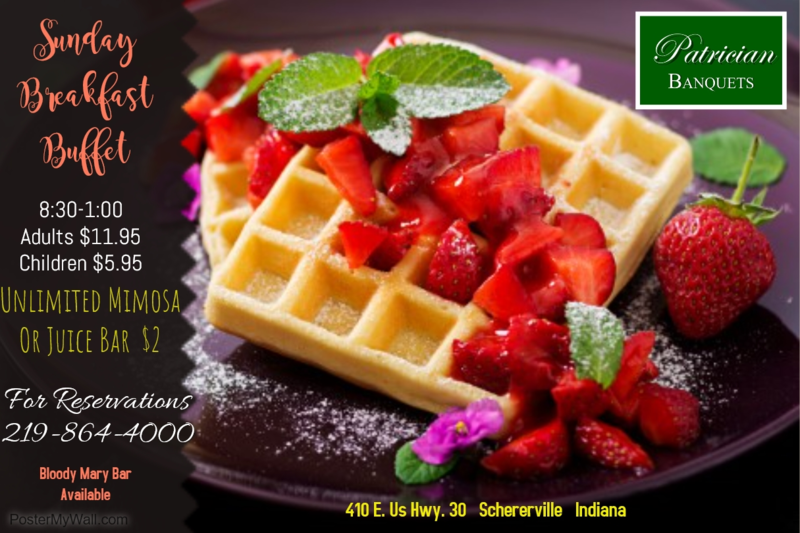 We are proud of the products, service, and professional standards that have made the Patrician Banquet Center one of the leading catering and banquet sites in Schererville and surrounding areas. At the Patrician's events we keep things enjoyable and we keep our guests talking! Browse through our events calendar so you don't miss a thing. 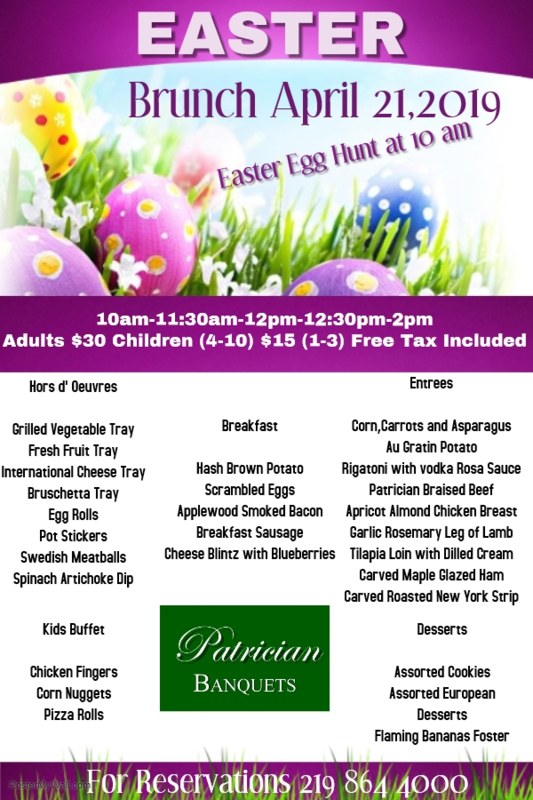 Call today for your Easter reservations for April 21st, 2019. Resercation times are 10am, 11:30am, 12pm, 12:30pm and 2pm. Easter egg hunt for the kids at 10:00. 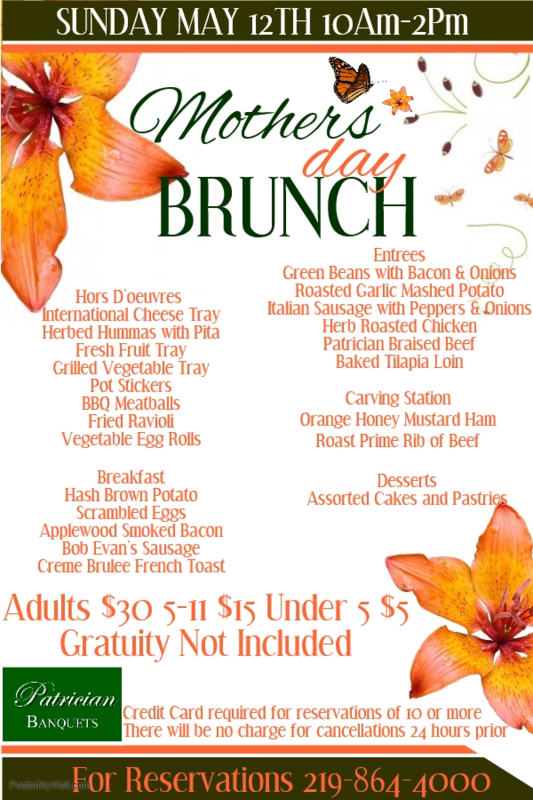 Call today for your Mother's Day reservations for May 12th, 2019. Reservation times are 10am, 11:30am, 12pm, 12:30pm and 2pm. Join today and receive a coupon for buy one, get one free pass to our Sunday Breakfast! My husband and I just used The Patrician for our wedding ceremony and reception, and we were happy with everything! They have a wonderful staff, great food, and I could go on and on! My guests were very impressed with the staff. I have been to many events at The Patrician, and it is the nicest hall in the region! The chef does a great job with all the menu items. I have always been extremely impressed! Its a BEAUTIFUL VENUE!! Chef is amazing and prepares a variety of wonderful entrees, appetizers, and desserts with a presentation like no other. The wait staff is efficient and friendly. They go above and beyond to make the guests feel special! I love this place! Great service, great food, great family owned business that is dedicated to helping you create exactly what you want for your event! You will not be disappointed! They did everything they could to make our day go perfect. Thank you so much! I would recommend them every time. The food was delicious and the staff was friendly. The whole event went way above our expectations.